The summer I turned 15, my family moved from the inner-city suburb of Decatur, Georgia to Conyers (a.k.a. “the country”), purchasing 32 acres of pristine forest land. There are advantages to being the first home on a 5-mile dirt road in the middle of nowhere, whose acreage was previously used only for logging. But there’s also a disadvantage: For the first few months our home was being built, we had none of the modern conveniences you expect in America. No electricity. No AC (remember, it was summer in the South). No refrigeration. Worst of all, no plumbing. For several months, I (as the oldest son) had to use post-hole diggers to create a latrine approximately 1 foot wide and 3 feet deep. I would put two concrete blocks on either side of the hole, stretch two 2-x-4’s across them about 1 foot apart, and that was the toilet my entire family used, covering our waste with dirt as we went. When that hole was full, I would dig another, and another, and another. Needless to say, it was a VERY well-fertilized forest. But the worst part was the lack of running water. Every day that summer (sometimes several times a day), I’d take two 10-gallon pickle buckets down a path through the woods to Little Haynes Creek, where I would fill the buckets with water. Then I would make the trek back up the hill to our house, where we would boil the water to use for drinking, bathing and, eventually (when our plumbing was installed), flushing the toilets. Needless to say, I developed a great empathy for people in parts of the world where indoor plumbing/running water are some sort of dream. 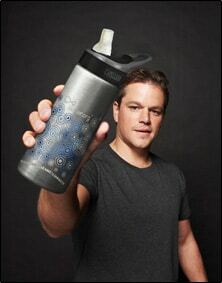 I first learned about Water.org through Matt Damon. My career as a writer started as a music critic and entertainment journalist, so I’d had the pleasure of interviewing Damon several times over the years. 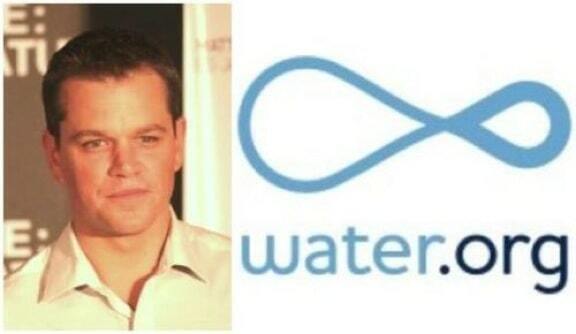 At a 2009 Toronto Film Festival press conference for The Informant, Damon and I got into a discussion about the new organization, which was the result of a merger between H20 Africa (a company Damon co-founded in 2006) and WaterPartners (co-founded by Gary White). The Water.org mission is incredibly simple: To provide safe drinking water and sanitation to people in developing countries. The developmental aid non-profit accomplishes this by “forging partnerships with local organizations in the countries it serves, involving the community at each stage of the project, selecting technology appropriate to the local community, and integrating all projects with health and hygiene education. While the politicians continue to ignore the global water crisis, Water.org is taking action to address a problem that currently affects nearly a billion people worldwide. They’re working with local micro-finance companies to dig wells, improve sanitation, and offer education in countries such as Bangaldesh, Ethiopia, Ghana, Haiti, Honduras, Kenya and Ghana. They’re hoping to expand their programs into other areas, but like every great non-profit organization, they need our help. So how can you help? The easiest way is to make a donation. Even if you don’t have a lot of extra cash, as little as $25 can provide one person in a developing country with clean water for life! You can also get involved, signing up for monthly updates, spreading the word via social media networks, downloading lesson plans and fact sheets to share with friends and family, or helping to raise funds on a local level. You can also donate your Facebook and/or Twitter status!